Designed and built by hand at our factory in Norfolk using only the finest FSC® certified timber, this stunning Wiveton Summerhouse was recently installed for a customer based in Liverpool, Merseyside. 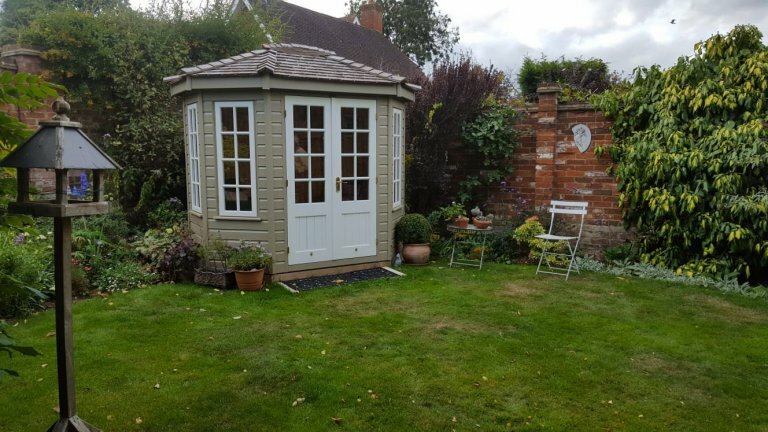 Measuring 1.8 x 2.5m, the Summerhouse was both delivered and installed by our expert, in-house fitting team. Externally, the building is clad with smooth shiplap and painted in a two-tone fashion with the shades of Taupe and Ivory selected by the customer. The customer opted for ivory on the doors and window frames to contrast nicely with Taupe on the exterior of the main building. The distinctive octagonal roof is covered with cedar shingle tiles which are both attractive and naturally sympathetic in outdoor surroundings. 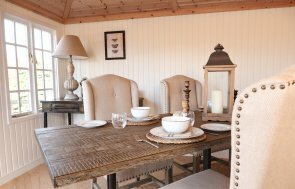 Internally, the Wiveton is insulated and lined in the both walls and ceiling as standard with natural pine lining for a warm and cosy feel. There are four opening Georgian windows for ventilation and natural light. In order to browse our range of Summerhouses for yourself, we recommend that you visit your nearest showsite where there can be up to 25 different display buildings for you to browse as well as a team of friendly advisors on hand to assist you. Alternatively, get in touch with us on 01760 444229 or continue browsing online.